The year is 105 P.A. and Emperor Prosek has unveiled the Coalition’s new Campaign of Unity, a plan to expand the CS and sweep aside demons, aliens and users of magic. The Siege on Tolkeen begins and the secessionist State of Free Quebec must be punished and brought back into the fold. 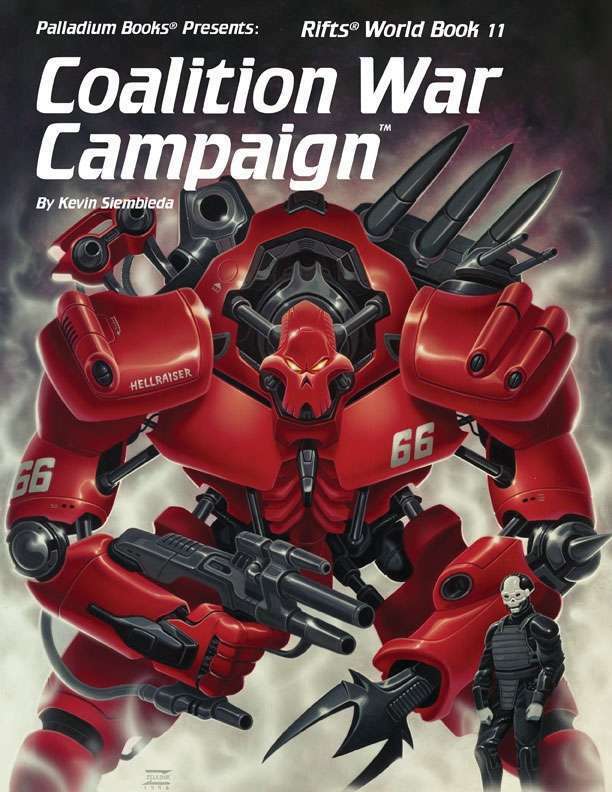 Coalition War Campaign™ is packed with new weapons, equipment and vehicles, as well as information on the Coalition military, new O.C.C.s, tactics, deployments, commanders and personnel. CS power armor like the classic SAMAS and new Super SAMAS, the Glitter Boy Killer, Terror Trooper, Mauler & others. Robots like the Hellraiser, Hellfire and mighty Skull Smasher. Tanks, APCs, the Spider Scout Walker, hover cars, rocket bikes, mobile strike fortress, aircraft and more. New Skelebots, new style Dead Boy armor, weapons & equipment. More than a dozen CS military O.C.C.s, including the CS Cyborg Strike Trooper, CS Juicer, RPA Ace and Special Forces. The ISS, Psi-Net, and NTSET city protectors & police. Monsters and D-Bee races common to the ‘Burbs. The Coalition’s military structure, ranks, key leaders, etc. Profiles for Emperor Prosek, Joseph Prosek and ranking generals. Updated profiles for Erin Tarn and Sir Winslow Thorpe. 224 pages by Kevin Siembieda. For more information, or to purchase a physical copy of this or any other Rifts® title, please visit www.palladiumbooks.com. This title was added to our catalog on January 29, 2016.